This is a required prerequisite course in order to attend the “Rappel master course”(see below). 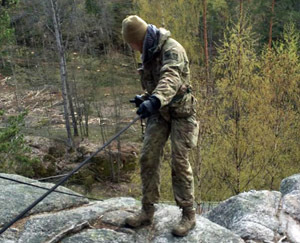 Produce a person capable of assessing, analyzing and performing rappelling operations safely. This class is designed for the adventurer, military, police and or caver who has a need for such skills. Good physical condition, motivated, and must be capable of moderate physical movement up & down steep hills and trails. All students will be awarded an IMTT certificate of training suitable for display and framing. 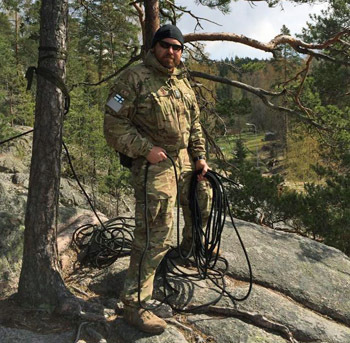 Monte Gould is a graduate of the USMC HRST (Helo Rappel Master Course), US Federal BIA Rappel master / Air Assault course, State of California Rappel master course. He served as a state of California rappel-master for dozens of professional level courses with SWAT personnel. In served as a US Military rappel-master conducting said training for military personnel with regularity. US Military veteran 1978-2011; serving as a Team Sergeant in Afghanistan with US Special Operations Forces, the elite French “Commando Hubert” and Dutch Special Forces. He has been awarded French, Finnish and US achievement and service medals as well as multiple combat awards. Since 1986 he has served as a SWAT member, Team leader and Master trainer for Tactical units in the state of California as a full time peace officer. He has worked with members / groups of numerous elite Special operations units from around the world and been assigned to the same. Objective; produce a confident, competent and safe instructor capable of selecting, securing and conducting a safe rappelling training session with students / personnel with little to no experience. General; this course of instruction is focused on the use and employment of ropes and equipment relative to rappelling. You are expected to arrive with an understanding of basic safe rappelling practices and have completed a formalized certified course of instruction on basic rappelling. 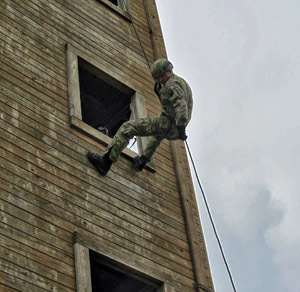 On arrival you will be subjected to a rappelling qualification course and written test. The student should be somewhat physically fit (moderate physical demands) able to stand for extended periods. On arrival you will be immediately subjected to a qualification course & practical exercise. Rain or foul weather gear if weather dictates.